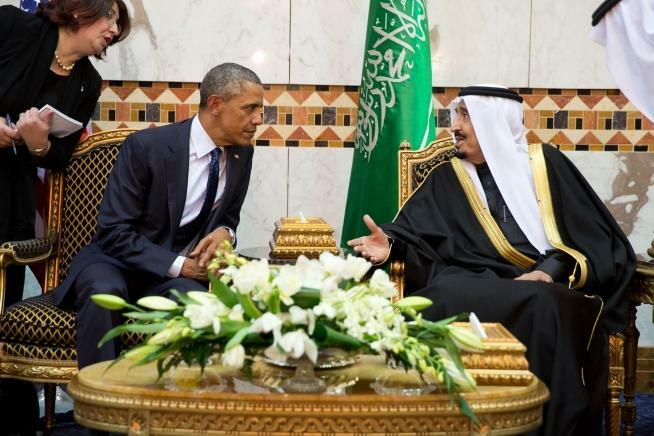 President Obama meets with King Salman during a 2015 trip to Saudi Arabia. “Putin has his ‘Mission Accomplished’ moment. He said ‘I’m withdrawing troops.’ He’s shored up the Assad regime,” said Joshua Landis, the Director of the Center for Middle East Studies at the University of Oklahoma and the author of the blog Syria Comment. “It established the fact that Russia is not going to let its interests be beaten,” Landis said. But the United States views Russia as a pest, and doesn’t want to work with them. Landis says the U.S. wants to undermine Russia by getting ground-to-air missiles into Syria. Landis says 70 percent of Syrian Arabs live in areas free from conflict. But most young men wind up in the Syrian Army. Money will get you out, but there’s a general feeling of despair among the poorest residents. Landis says he sees only two solutions – either one side emerging victorious, or a partitioned society. No one will let that happen though, because Russia, the United States, Iran, and Saudi Arabia all have proxy interests in the country. The other option would be dividing the country like what happened with the former Yugoslavia. But that could easily lead to another decade of war, and an eventual divisive stalemate with no real progress, similar to the Balkans. President Obama visited Saudi Arabia this week, amid contention and difficulty over 28 pages dealing with the country in a report about the September 11 terrorist attacks. Landis says as President Obama continues to move the U.S. away from its relationship with Saudi Arabia, the Saudis feel abandoned. Landis said Obama wants to pull Iran out from under the crushing weight of banking sanctions as one of his presidential legacies. Landis also called Saudi Arabia a “millstone around the United States’ neck,” and says a bill pending in Congress to allow families of the 9/11 victims to sue the Saudi government could have significant economic implications.